Petros goes on and on a bit: 40th Anniversary - Apollo 11! 40th Anniversary - Apollo 11! Congratulations of course, to Neil, Buzz and Michael, this being the 40th Anniversary of the first landing on the moon. I do have a 40 year old grudge with Neil though. "Next time for sure!" I thought. Nope. Al Bean buggered the Apollo 12 video camera by pointing it at the sun just after he and Pete Conrad started their moonwalk. Nope. 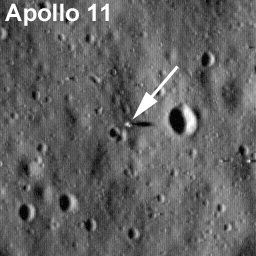 Apollo 13 never landed, but that's another story. AMAZING! FINALLY! Live TV from the moon with Apollo 14! Wee...! Yeah, being in Year 5, we were stuck in the back of the assembly hall to see the (very fuzzy) b/w broadcast. It was a few months before it was discovered I needed glasses, but when I caught a repeat of the walk a few years later, the images were still fuzzy!